Every Day, Some One Will Ask Me Why I Built A Rubber Band Ball! Or They Will Go "How Did You Make It?" Well Maybe This Little Bit Of History Will Clear Up All The Stupid Questions! It All Started About 3 Years Ago In My Bedroom. At The Time I Was Only 12 Years Old And Had A Job Delivering Newspapers For The Fremont News-Messenger. I Had Only Been Delivering News Papers For A Year Before Any Rubber Band Ball Was Thought Of! So One Day I Was Up In My Room, With Tons Of Rubber Bands Lying Around Me. As Usual I Was Bored! So I Started To Wrap The Rubber Bands Around Things In My Room. For Example I Wrapped Them Around A Pop Can, Pencils, And Books. I Got Bored Really Quick Because I Needed A Bigger Challenge. So The Next Day I Was Up In My Room Again Surrounded By Rubber Bands! Well This Time There Was A Baseball In My Room So A Grabbed It And Started To Wrap Rubber Bands Around It. By The End Of The Day The Ball Was About The Size Of A Softball! Later The Next Day, I Went Up To My Room To Work On My Rubber Band Ball And Thought I Should Use Something Smaller For The Core Of The Ball. So I Went Downstairs And Looked For The Smallest Ball I Could Find. So I Found A Miniature Pool Ball. So I Found My Core, All There Was To Do Is Take All The Rubber Bands Off Of It. So For The Next Hour I Furiously Took Off All The Rubber Bands. After I Was Done I Started To Put The Rubber Bands Around The Miniature Pool Ball. I Got The Ball Up To About Baseball Size That Day. The Next Day I Got On To The Internet And Searched Around For Rubber Band Balls And To My Surprise I Was Not Alone In This Hobby. I Started To Make Charts And Graphs About My Ball Towards It's Goal. Back Then My Goal Was To Get To 70 Inches In Circumference. I Thought That Would Be Around 40 Pounds But Boy Was I Wrong! I Figured That I Was Wrong After I Learned More About Rubber Band Balls. I Guess You Could Have Called Me Obsessed With My Rubber Band Ball But I Was Proud Of It! Well I Am Not As Obsessed As I Am Now But I Still Have Pride And Joy In My BIG Rubber Band Ball! Well A Year And Half Had Passed And My Rubber Band Ball Weighed An Amazing 11 Pounds! I Noticed One Thing That All Of The Other Rubber Band Balls Had That Mine Did Not, Besides A Name. All Of The Other Rubber Band Balls Was 100% Rubber Bands, Made Of Nothing Except Rubber Bands! Well Some People May Ask Then Why Didn't You Make A Rubber Band Ball That Was 100% Rubber Bands? Well I Tried Believe Me. I Tried Several Times And They All Failed! So Finally In January 2000, I Went To My Mothers For The Weekend. I Took My Ball And About 4 Pounds Of Rubber Bands With Me! On January 7, 2000 About 8 o'clock I Tried To Make A Rubber Band Ball That Was 100% Rubber Bands! I Was Determined To Do It And Guess What? My New Rubber Band Ball Was Born! 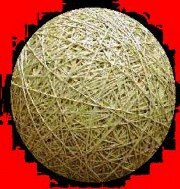 I Spent Hours And Hours On The New Rubber Band Ball To Get It As Big As Possible. After 2 Days, The New Rubber Band Ball Now Weighed 3 Pounds! Now With The New Ball Being Born I Didn't Bother Getting The Rubber Bands Off It And Put It Aside. Still The Bigger Ball Was Still Respected But Soon Enough The New Born Ball Was Just As Big! This Caused Me To Give My Old Rubber Band Ball Away To One Of My Best Friends. Currently He Has Added About 3 Pounds To The Ball Since Then. My Aunt Betty Kept Donating Rubber Bands To Me And The Rubber Band Ball Grew To Be To Big For The Rubber Bands Real Quick! Weighing A Stunning 42 Pounds! So Now I Had To Get Online And Search For Hours And Find Some Rubber Band Companies. I E-Mailed Tons Of Companies For A Sponsor But None Of Them Replied. So Mean While I Was Talking With The Owner Of The World's Largest Rubber Band Ball, John Bain. He Helped Me By Giving Me This Companies Website. It Turns Out That I Ended Up Ordering 30 Pounds Of 6"x1/4"x1/16" Rubber Bands From Buford C. Smith. The Rubber Bands Came In 30 One Pound Bags Of Blue Rubber Bands. They Was About $2.55 Pound. Putting Every Single Rubber Band That I Ordered On In One Whole Weekend Made My Ball Grow Humongous! Now My Rubber Band Ball Weighed A Very Amazing 72 Pounds! That Was Bigger Then Every Ball On The Net Except For John Bain. I Was Not Going To Stop Till I Have Broken The World Record So I Shopped Around On The Internet Again, This Time Finding A Company Called Keener Rubber Company. I Gave Them A Call And Ordered 40 Pounds Of Rubber Bands. This Time They Was Normal Color And Was About $2.45 A Pound! This Time I Took My Time And Put The Bands On Over About A Mouths Period. The Ball Now Surprisingly Weighed 112 Pounds! But Then I Became In Debt From The Rubber Bands And Christmas Shopping And Going To Las Vegas With My Family Took Up A Lot Of My Money. But Now I Am Determined To Change That! The Rubber Band Ball Hasn`t Grown For About A Year. So Around October 2000 I Just Couldn't Stay Away From Building Balls. So This Time I Took A Roll Of Masking Tape And Made A Masking Tape Ball! Currently That Weights 74 Pounds And Is 48 Inches In Circumference Also 15 Inches In Diameter! Made Up Of 321 Rolls! Currently Is The World's Largest Masking Tape Ball. I Fell Behind In Making Of Both Balls For A Long While Especially The Rubber Band Ball That I Got Online And Found Matt's Rubber Band Ball Page! After Seeing His Page It Re Inspired Me To Continue My Rubber Band Ball So I Made A Web Page And Contacted The Fremont News-Messenger And Got A Story! Hoping That I Would Get Some Donations So I Could Add More Rubber Bands! Thanks Matt! Some How He E-Mailed Me His Link Along With 20 Other People So I Thought It Was Junk Mail But This Time It Said Rubber Band Ball So I Had To Check It Out! Now I Will Be Adding Rubber Bands To My Ball!!! So Please Donate Some Money To Me And I Will Add You To My Donors Page!